The Beyoung Coccyx Cushion is made of high quality memory foam and helps relieve back pain by reducing pressure on the coccyx and tailbone with its innovative design. Superior to u-shape cushions our revolutionary elevated rear provides maximum support and helps achieve proper spinal alignment while the tapered front hugs the thighs and relieves pressure on the hips. The ergonomically designed cushion brings comfort to your office chair, car seat, wheelchair, rocking chair and plain seat. Enjoy the Cushion Seat Everywhere - Lightweight! For use at home, in the car, wheelchairs, at the office, airplanes, trains, buses and more. The base is made of non-slip material to hold it in place. The zippered cover ensures easy removal for cleaning in the washing machine. Improved and Protect You - Posture Correction! Its perfect cut and shape provides support, comfort, and helps straighten and correct your posture. The seat pillow protects you from sitting in wrong and harmful positions. 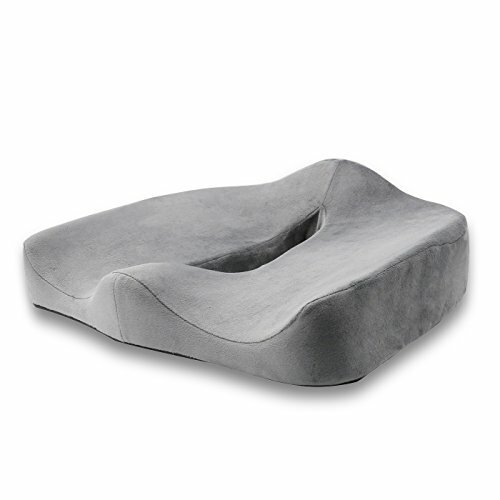 Enjoy comfort and productivity with the precisely molded memory foam that allows you to sit for hours at a time in your office or car comfortably. COCCYX ORTHOPEDIC CUSHION FOR YOU - Features a increase streamline design on the back seat, support the coccyx and lower back, effective in sciatica, tailbone and back pain relive. ASSISTS IN SCIATICA & RELIEVE PRESSURE - Superior to U-shaped cushions our new design relieves hip pressure by hugging the thighs and minimizes leg numbness with its tapered front. Perfect for bed sores, pregnancy, afterbirth, wheelchair. HOLLOW SPACE FOR VENTILATION - Special designed with a hollow, Providing relief for hemorrhoids, prostatitis, post delivery recovery for mothers and other perineal and pelvic floor disorders. ANTIBACTERIAL, BREATHABLE & REMOVING DAMPNESS - Breathable hygienic velvet can be washed and antibacterial, never worry about the dirty cover, luxury memory foam provide gentle support to lower back, relieve and ease your office, car driving and long wheelchair sitting fatigue.